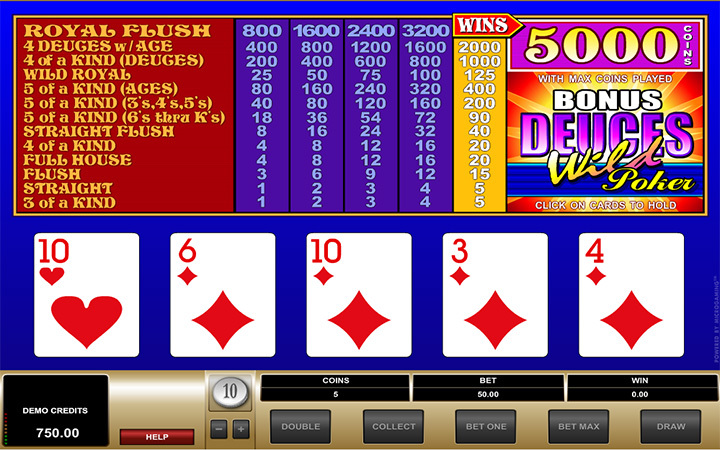 Deuces Wild is the most profitable version of video poker – RtP values can reach as high as % 100.8. In other words, playing Deuces Wild games can be a very profitable hobby! Microgaming raises these values even further in Bonus Deuces Wild game. This is classic five-card draw poker game, but all twos count as wild. You may remember the wild system from slot games; wilds can substitute all other cards in a poker hand. In other words, if you get a two in your hand, it can be used to complete a winning combination or upgrade it to a better hand, regardless of the suit. This system raises your winning odds and results with better payouts. This is also the case for Bonus Deuces Wild by Microgaming. The interface (and the graphical quality) of the game is pretty simple. You can see the paytable to the top of the screen, showing the payout values of each hand. As you can see, you need to bet higher to get bigger payouts. For example, Royal Flush pays only 800 coins if you play with one coin per spin. But if you bet 5 coins for each spin, the payout value raises up to 5.000 coins. So always play with maximum bet values. The game has two more poker hand combinations which you can’t see anywhere else, this is why it has a “Bonus” in its name. These hands are 4 deuces with an ace and five of a kind. They are pretty much self-explanatory hands and raise your winning odds even higher. Click on the “deal” button to get your first hand. Analyze it, hold the cards you want to keep by clicking on them, and hit the “draw” button. You will get new cards and if your hand is one of the winning combinations, you get paid – simple as that. As we mentioned above, you can set the coin values between 1 and 5, which makes the maximum bet value a total of 50 coins. No need to worry though, you get 100.000 coins in the demo version which allows you to play literally for hours. Bonus Deuces Wild is a simple game, but contains very high payouts. If you like to play video poker games with high-stakes, take a look. Play at Casino Ave for more card games goodness!